The newest healer is ready to carry people up the competitive ladder. Baptiste in competitive. Image via Blizzard Entertainment. Get ready to say thank you to Baptiste: Overwatch‘s newest hero will be available in competitive mode on April 2. Players will now be able to use Baptiste’s impressive support kit in a competitive setting, working with their team to win and gain Skill Rating (SR) points. The combat medic has been available to play in other modes, such as arcade and quick play, for two weeks. This is a standard “practice time” for new heroes introduced to Overwatch so players can get accustomed to their abilities. Baptiste’s introduction to competitive mode aligns with his availability in Overwatch League games beginning April 4. His presence in competitive games will likely have an effect on hero choice in the coming weeks. 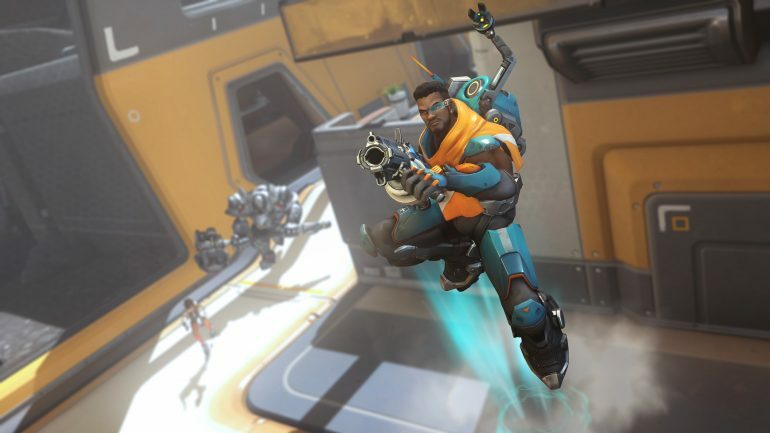 Since he has not yet been played in large-scale tournaments, many players will have to experiment within their own games to see where Baptiste fits. His ultimate, Amplification Matrix, doubles the damage or healing of projectiles aimed through it. Baptiste will then pair well with heroes that can use this ability, such as Junkrat, Soldier: 76, Ana, and Zenyatta. Baptiste has not yet been classified as a “main” or “flex” support by professionals and analysts in the scene. While he can put out the level of healing required of a main healer, the importance of his other abilities may put him in the flex field. The true impact of one of his abilities, Immortality Field, may largely decide how often he is played in a professional context. Allies cannot die within the borders of an Immortality Field, but they can drop to a dangerously low health percentage. The exact timing and placement of a field could negate the effects of normally fatal hero ultimates, like D.Va’s Self-Destruct or Junkrat’s RIP-tire. It will be up to players on the competitive ladder to see how viable Baptiste is in lower ranks. As a public service announcement, please remember that competitive mode isn’t the best time to pick up a new healer. Only add him to your healer hero pool after you’ve taken the time to perfect all of his abilities in a less stressful environment.